Biofuel Crop Sustainability brings together the basic principles of agricultural sustainability and special stipulations for biofuels, from the economic and ecological opportunities and challenges of sustainable biofuel crop production to the unique characteristics of particular crops which make them ideal for biofuel applications. This book will be a valuable resource for researchers and professionals involved in biofuels development and production as well as agriculture industry personnel. 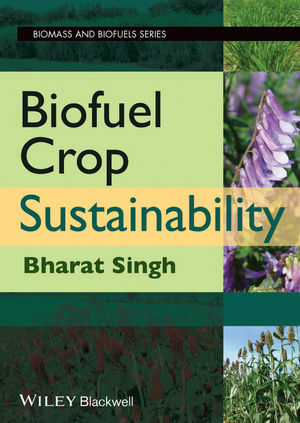 Chapters focus the broad principles of resource management for ecological, environmental and societal welfare, the sustainability issues pertaining to several broad categories of biofuel crops , as well as the economics and profitability of biofuels on both a local and international scale. Coverage includes topics such as utilizing waste water for field crop irrigation and algae production, reliability of feedstock supply, marginal lands, and identifying crops with traits of significance for survival and growth on low fertility soils. The development of production practices with low external inputs of fertilizer, irrigation, and pesticides is also covered. Biofuel Crop Sustainability will be a valuable, up-to-date reference for all those involved in the rapidly expanding biofuels industry and sustainable agriculture research fields.